Prepare for USP 800 � NuAire, Inc.
NuAire is committed to creating quality, long-lasting products designed to cost less with an emphasis on your safety. Put your trust in NuAire and see why NuAire is the safer choice for your pharmacy. 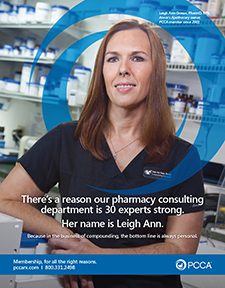 For over 40 years, NuAire has been recognized as the leader in providing pharmacy professionals with reliable products with the best performance and best protection for the most demanding environments. Max D. Peters founded NuAire in 1971, on the principle: �the best in industry service, expert knowledge, and consistently providing quality laboratory equipment.� Every product is built exactly to your order. NuAire builds integrity and reliability into every product utilizing True Laminar Airflow, the HEPEX� Zero Leak Airflow System, state-of-the-art electronic systems, and ergonomic design. 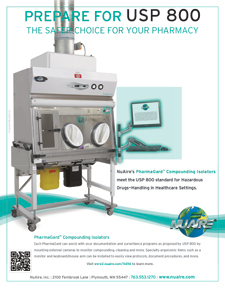 NuAire�s PharmaGard Compounding Isolators meet the USP 800 standard for Hazardous Drugs � Handling in Healthcare Settings. PharmaGard Isolators create an ISO Class 5 sterile environment, meeting the requirements of USP Std. 797 for compounding of sterile products. NU-PR797 Positive Compounding Aseptic Isolator, NU-NR797 Negative Pressure Re-circulating Compounding Aseptic Containment Isolator, and NU-NTE797 Negative Pressure Total Exhaust Compounding Aseptic Containment Isolator. NuAire also offers energy efficient biological safety cabinets and laminar flow clean benches for use in ISO Class 7 cleanrooms. NuAire offers a Class 1 Biological Safety Cabinet (BSC) that can be exhausted or recirculated back into a negative pressure room through a redundant HEPA filter system. NuAire�s Compounding Aseptic Containment Isolators (CACI) and Class II BSCs allow camera to be externally mounted to support surveillance and documentation programs. A computer monitor with keyboard/mouse arm can be added to your CACI or BSC allowing technician�s easy access to compounding and cleaning SOPs. 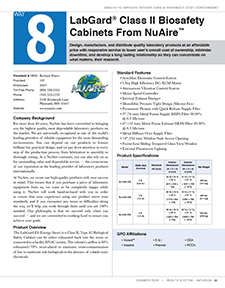 NuAire is also a manufacturer of Laminar Airflow Workstations (LAFWs), Compounding Aseptic Isolators (CAIs), and custom airflow solutions designed to meet the needs of USP 797 and the proposed USP 800. 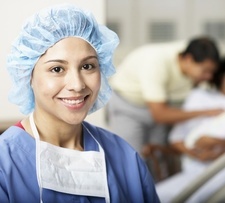 � Handling in Healthcare Settings. Each PharmaGard can assist with your documentation and surveillance programs as proposed by USP 800 by mounting external camera to monitor compounding, cleaning, and more. Specialty ergonomic items, such as monitor and keyboard/ mouse arm, can be installed to easily view protocols, document procedures, and more. QleanSpace is a turn-key cleanroom with guaranteed functionality. Our highly adaptable solutions have short installation time, and provide a safe and efficient environment for your pharmacy operation. All components are factory-assembled and tested before shipping. QleanSpace will help you transform your existing pharmacy environment into a facility with USP<797> and/or cGMP compliance. QleanSpace constantly monitors the level of airborne particles, the pressure levels, the temperature and humidity, and displays them on screen to make all data easily readable by the staff inside and outside the area. Warning signals are issued at pre set levels when approaching the cleanroom rating limits. QleanSpace�s compliant cleanrooms extend the protection to health care personnel from exposure to hazardous drugs. Having a Qleanspace cleanroom means you have a future proof solution from both, regulatory mandates as well the ability to change, move or expand as you grow. Our turn-key cleanrooms include guaranteed functionality. Other benefits to having Qleanspace cleanrooms are, short installation time to not interfere with a demanding schedule, being pharmacy retrofit, and most importantly, providing a safe and efficient environment for your pharmacy operation. 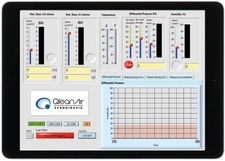 QleanSpace can be configured to meet cleanliness requirements to Class 100/ISO 5 using HEPA or ULPA fan/filter modules for control of submicron particles. Having safe and easily obtainable access to your hazardous drugs can save you valuable time, and give you the advantage of not having to outsource. QleanStore is our hazardous drug storage area, separate from other inventory to prevent contamination and personnel exposure. QleanStore is engineered to be a negative pressure room with at least 12 air changes per hour (ACH), and meets USP <800> standards. HDs are stored at, or below eye level on secure shelves with raised front lips to avoid accidental falling. All these features we put into our QleanStore helps protect your people, products, and processes. Our RPG (Rental with Performance Guarantee) rental option includes full service and maintenance, with a full guarantee of the facility and its function with no upfront or start-up costs. Become a QleanAir partner, and future-proof your operations with adaptable, innovative solutions! ScriptPro�s Technology to improve safety in one of the highest risk practices in hospital pharmacies in several ways. Positive matching to the patient's medication order decreases the risk of using the wrong drug. The pharmacists� review digital images of the critical process steps, including the volume of medication injected into the IV bag. A technician scans the barcode on the chemotherapy drug vial. A computer match to the patient record ensures that the correct formulation has been selected. In the preparation room, the technician captures an electronic image of the vial label and the filled syringe just prior to injecting the medication into the patient's IV bag. Before completing the preparation, the technician presses a button on the ScriptPro Telepharmacy screen to request pharmacist verification. A clinical pharmacist, working outside the preparation room, reviews the images of the drug vial, the pullback on the syringe containing the medication, the IV bag, and the patient's medication order. Confirmation of the review steps and related images are archived as part of the electronic record and are available for future reference. There is no need for either party to go through the procedures of entering or exiting the isolation room. Modular Cleanrooms knows cleanrooms can be constructed out of many varying materials from sheet rock to flexible vinyl, but no matter what material it is, the HEPA filter is the heart of every Cleanroom. 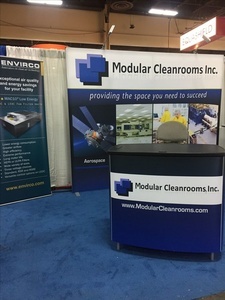 That is why Modular Cleanrooms is a Master Distributor of Envirco Corp. and has the largest inventory in the central US of Mac 10 Fan Powered HEPA Filters. Along with the Mac 10 filters we stock several styles and sizes of cleanroom light fixtures (T8 with electronic ballasts) in standard Troffer and Flo-Thru styles, Suspended �T� Bar ceiling grid and ceiling tiles. We also stock replacement motors, pre-filters and HEPA filters (standard and RSR) for the Mac 10 series of Fan Filter Units (FFUs). Modular Cleanrooms is also able to purchase replacement HEPA filters directly from the manufacturers for most popular brands of FFUs. 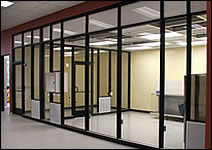 Modular Cleanrooms offers several designs to meet all of our customers' needs. The Econo-Tent softwall cleanroom is the most economical approach and design for your cleanroom needs. This design is commonly used in the microelectronics and medical mold injection industry as well as many others. Econo-Tent's softwall design allows it to be used as either a totally freestanding room or it can be used in combination with your existing walls and ceiling. Each room comes completely factory prefabricated for minimal on-site erection time and is totally self-contained with all components factory-finished. Modular Hardwall Cleanrooms are prefabricated, factory engineered and designed to meet a full range of cleanroom requirements found in industries ranging from Micro-Electronics, Aerospace, Medical equipment and packaging. 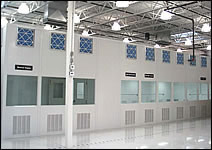 Modular Hardwall Cleanrooms are also an excellent product for the Compounding Pharmacy market. They meet and exceed all of the requirements found in USP 797. The Aluminum Bio-Clean design emphasizes particle infiltration as well microbial contamination protection. The Aluminum Bio-Clean can be designed and certified to as clean as Class 10 (ISO 4) up to Class 100,000 (ISO 8) as well as Class 10,000 for USP 797. Each Aluminum Bio-Clean cleanroom can also be outfitted with Class 100 (ISO 5) work zones eliminating the need for (ISO 5) Clean Benches/Hoods. 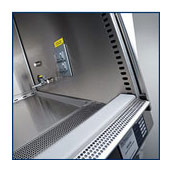 The Micro-Clean cleanroom is specifically designed to meet requirements of the medical and pharmaceutical industries. Micro-Clean's design allows it to be used as either a totally freestanding room or it can be used in combination with your existing walls and ceiling. The Micro-Clean comes completely factory prefabricated for minimal on-site erection time and is totally self-contained with all components factory finished. Since 1978, Esco has emerged as a leader in the development, design, and innovation of laboratory, medical and pharmaceutical equipment solutions. Esco, selling more than 100,000 systems across the world, has expanded the breadth of its product line to include temperature control devices (such as freezers and incubators) and more. The signature characteristics of the company are the high value of systems, customer service focus, product quality, and the commitment to working with clients in developing systems that meet the growing market demands. Esco offers the most diverse equipment range for pharmacy compounding applications - from laminar clean benches, BSCs, containment ventilated enclosures to isolators - based on client�s application and budget requirements. Our company is the first to launch cGMP-compliant isolators into the pharmacy compounding industry in the United States, making Esco a proven market leader in clean air technology. Our pharmacy compounding isolators exceed the demands of 503A/503B facilities and are compliant with USP 797/800 and FDA cGMP standards, respectively. Initially engineered for the pharmaceutical industry, these isolators are now used in pharmacy compounding applications, following the trend of stricter guidelines and practices. Pressure testing to Class 2 containment enclosure as described by ISO 10648-2 standard, which can be done on-site without using blanking plates and silicone. Bag-In, Bag-Out and Low Contamination filter changes in isolators ensure operator and environment protection during a filter change. By incorporating customer feedback, Esco continuously innovates, designs, and manufactures biological safety cabinets and laminar flow cabinets that have more features than any cabinets in their price range. Esco delivers protection at cost-effective price that suits any budget requirements. Equipped with the latest generation US-made single DC-ECM blowers, our biological safety cabinets and laminar flow clean benches are considered the most energy efficient of its kind - giving the user more than $100 annual savings. Our BSCs and laminar flow clean benches are also equipped with ULPA filters, 10x more efficient than HEPA, that provides ISO Class 3 work zone ideal for compounding sterile preparations. Ventilated Balance Enclosure (VBE) is designed specifically for stability and accuracy while maintaining a high level of operator protection by containing hazardous compounds. Using our aerodynamic design on the sash, arm-rest, and sectionalized baffle, the airborne powders are well contained inside the enclosure and exhausted through a HEPA filter or direct to the lab exhaust. A unique filter mounting system eliminates bypass leaks inherent in conventional clamping systems by utilizing a special seal for H14 filters. 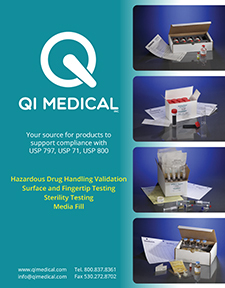 Our VBE is your trusted partner in providing you protection when handling non-sterile hazardous compounds. 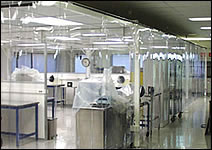 hoods and cleanrooms pharmacy hoods cleanroom equipment clean room solutions with Esco clean air technology. biological safety cabinets fume hoods ductless fume hoods laminar flow clean benches animal containment workstations cytotoxic cabinets and hospital pharmacy isolators PCR cabinets thermal cyclers and instrumentation by esco. Isocide with isoclean and cytoculture. Established. Committed Full Service. Innovative Provider. We are the manufacturers of the MIC Family of Isolators, which include the MIC Single, MIC Dual, MIC 797P and the MIC-EDU Systems. All of our products are manufactured in central Indiana. The MIC was designed by engineers with hazardous containment and aseptic expertise. Our engineering department is recognized throughout the world for their work with parenteral products and hazardous containment. The MIC product line is currently implemented in nearly every state in the country as well as in over a dozen countries overseas. We are quite proud of our globally dispersed, very satisfied, and extremely loyal client base. 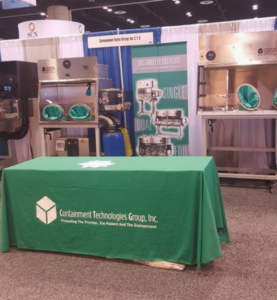 Containment Technologies Group, Inc. - Where our goal is Protecting The Provider, The Patient, And The Environment. Comprehensive USP<797> Services Provided by Containment Technologies Group, Inc.
We want to make your life easier! At Containment Technologies Group, Inc., we have a staff of professionals that live and breathe USP<797>. 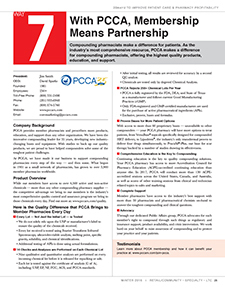 Whether it is providing your facility with products and supplies all the way to certification and training, we are here to provide your facility with a one-stop solution for all of your USP<797> needs. Baker has a long history of providing the highest quality containment and clean air products for retail, hospital and clinical pharmacy applications. Our products continue to set the industry standard for safety, performance, operating efficiencies and ergonomics through innovative research, meticulous engineering and on-going testing. 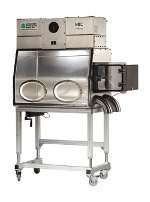 With pharmacy laws, guidelines and regulations targeting the preparation of sterile injectable drugs, clean air and containment equipment is playing an increasingly critical role in day-to-day pharmacy operations. 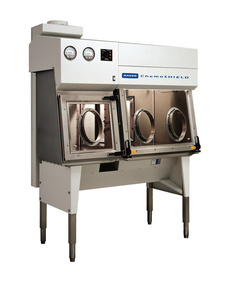 Laminar-flow clean benches, gloveboxes and biological safety cabinets are required in-house elements for minimizing potential contamination and exposure during compounding. For 60 years The Baker Company has been helping our customers advance science, discovery, and clinical care by providing the right equipment to meet their needs. We look forward to working with you! Positive pressure sterility assurance barrier glove box for complete product protection when compounding non-hazardous pharmaceutical compounds and related clinical, pharmacy and process applications. For sterile compounding of hazardous or potent pharmaceutical compounds, chemotherapy agents and IV admixtures that can be harmful to pharmacy personnel. The most energy efficient, comfortable and safe A2 cabinet in the industry, the SterilGARD e3 is designed for sterile product preparation and biological experimentation involving agents of low to moderate risk. 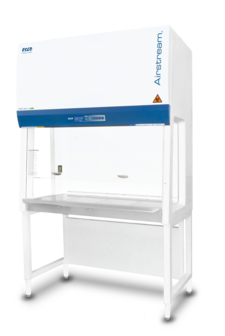 Also available is the compact model SG-303, a 3-foot biosafety cabinet with a smaller footprint for low-volume facilities. 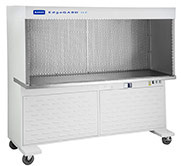 The BioChemGARD® e3 is a breakthrough in total-exhaust biological safety cabinets. 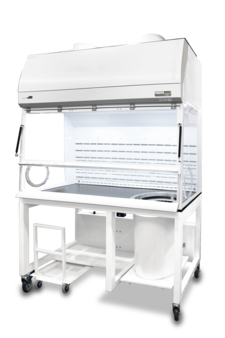 Engineered specifically for laboratories that need containment and removal of vapors, mists and particulates, the BioChemGARD e3 has a revolutionary airflow system that increases users� comfort and productivity while decreasing the overall operating costs. Designed for biological testing and product preparation involving low to moderate risk agents where chemical effluent is present and clean air is essential. With a spacious work area and brightly illuminated for maximum productivity and unique high velocity air return slots, EdgeGARD® HF Clean Bench offers both user comfort and product protection. Horizontal and vertical flow models are available. Phocus Rx remote compounding validation system from Grifols is a �plug & play� solution that provides a safe, reliable and easy-to-use environment to document and validate the compounding of prescription IV drugs. The system improves quality assurance and workflow efficiency by helping to ensure that medications are prepared correctly and labels are accurate. 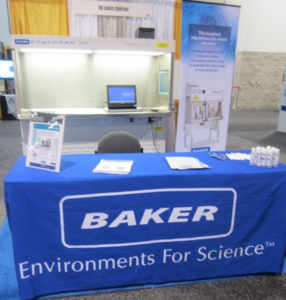 Baker biosafety cabinets and clean benches are available fully integrated with Phocus Rx. Design, manufacture, and distribute quality laboratory products at an affordable price with responsive service to lower user's overall cost of ownership, minimize downtime, and develop a long lasting relationship so they can concentrate on what matters, their research. For over 25 years Q.I. Medical, Inc. has been providing quality assurance products to hospitals and pharmacies practicing sterile compounding. 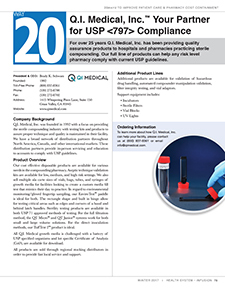 Our full line of products can help any risk level pharmacy comply with current USP guidelines. Your one-stop-shop for all your USP <797> and USP <800> needs. 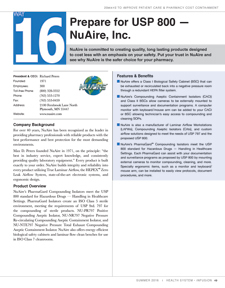 Prepare for USP 800 - NuAire, Inc.
NuAire is committed to creating quality, long lasting products designed to cost less with an emphasis on your safety. Put your trust in NuAire and see why NuAire is the safer choice for your pharmacy. 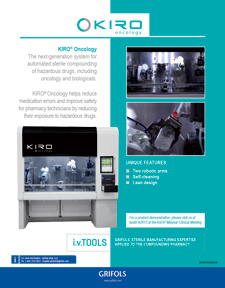 The latest technology for automated sterile compounding of hazardous drugs, including oncology and biologicals. 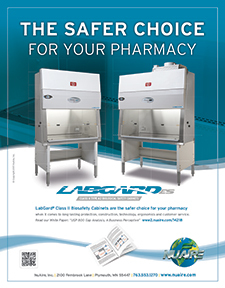 LabGard Class II Biosafety Cabinets are the safer choice for your pharmacy. Need help navigating your PEC requirements? Providing the Space you need to Succeed. Filtered Balance Systems for Non-Sterile Compounding. 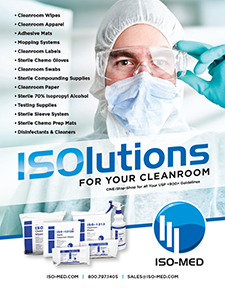 ISOlutions for your Cleanroom. Products for USP 797 and USP 800 Compliance! 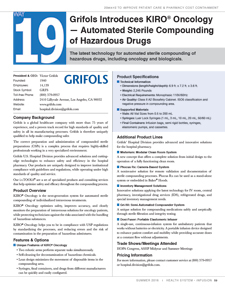 The MIC family of products are the perfect solution to your hazardous compounding needs. Products for your USP 797 and USP 800 compliance! What does USP <800> mean for your facility? 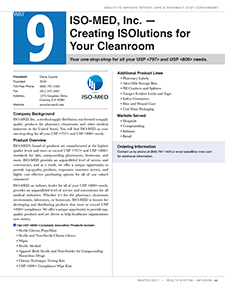 Allow PCS to help you meet your new gowning requirements for USP 797 & 800. 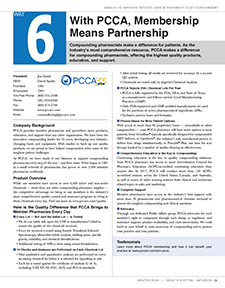 Total solutions for USP <800> compliance. A barrier isolator, or simply an isolator, is a device that provides a physical barrier between a pharmacist or technician and a work process. 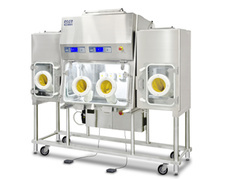 Isolators are routinely found in the pharmaceutical industry within hospitals, and with the recent implementation of USP 797 ("Pharmaceutical Compounding: Sterile Preparations", a set of sterile compounding standards issued by the United States Pharmacopeia), are increasingly used in pharmacy applications. They are designed to provide an isolation of a process or the maintenance of an internal condition (e.g., sterile or aseptic). Isolators may operate at positive, negative, or ambient differential pressure. Isolators may provide personnel, product, or environmental protection, or any combination thereof. They are used throughout industry, from orange juice filling lines to cytotoxic drug compounding to electronics manufacturing. Regarding pharmacy applications within hospitals, because people are the greatest source of contamination during aseptic manufacturing of drugs, reducing personnel interventions into the process zone has significant impact on the efficacy of the final drug product. In the mid 1980's, the industry began to employ barrier isolators, and later, in the 1990s, Restricted Access Barrier Systems, or RABS, to separate people from the process. The acronym RABS was coined by Stewart Davenport of Upjohn (now Pfizer). Since that time, the technology and applications of these systems has developed and broadened significantly. Quality and dependability for the future. For over 30 years NuAire has been universally recognized as the leader in providing laboratory professionals with reliable products for the most demanding environments. 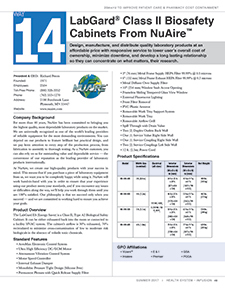 NuAire manufactures Biological Safety Cabinets, CO2 Water-Jacketed Incubators, Laminar Airflow Equipment, Ultralow Temperature Freezers, and variety of complementary products and systems to serve the needs of the world's laboratory community. 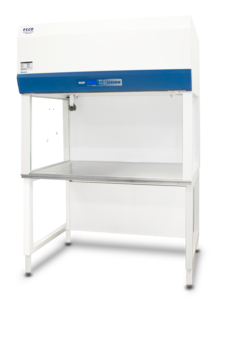 When you use a Baker biological safety cabinet, fume hood or clean bench, you will enjoy total confidence in its design, performance and containment capability within the broadest performance envelope possible. 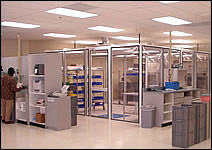 The Baker Company commitment to the clean air industry includes significant investments in testing, documentation and computerized, state-of-the-art research laboratories capable of simulating and controlling various common laboratory airflow environments. IsoTech Design: Our compounding aseptic isolator, modular clean rooms, and microenvironment systems provide a more cost-effective solution than traditional cleanrooms.solution (investment operation and maintenance ) versus traditional cleanrooms to provide a high level of sterility assurance, control microorganisms and particles contamination and provide containment management to meet the USP requirements (Chapter <797>) for pharmaceutical compounding and sterile preparations. Come see us at ASHP's Midyear Clinical Meeting in Orlando, Fla., Dec. 9-11. This meeting is the largest gathering of pharmacists in the world, attended by more than 20,000 pharmacists from around the world. This year's keynote speaker will also be Retired General Colin Powell, speaking on domestic and world affairs. RXinsider adds new Aisle to Virtual Trade Shows: "Cleanroom Certification"